I am one big ball of stress. We leave Friday morning at 8am for England for almost two weeks. So much stuff to do. Who the F is going to water our plants? It’s my mom’s birthday and my aunt is turning the big 70 over Christmas. Must get them cards! Forget about painting my nails. I’ll just wear my gloves indoors as well. I am also tasked with figuring out the NYE plan. I prefer low-key pub, but high maintenance KC refuses. Argh. But tonight we dismissed the frantic details to enjoy dinner and Scrabble with my mommy and daddy in Alameda before we leave on vacation. The four of us are all well-matched competitors; the final scores were fairly close. 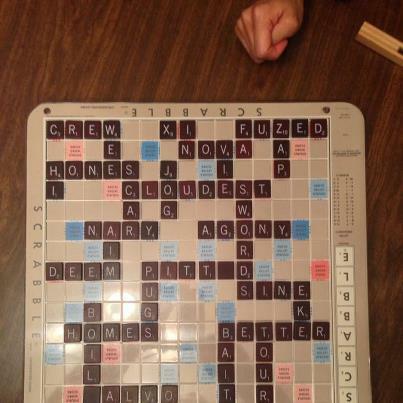 On my first turn, I was able to use all my tiles with a score of 78 yet I was ultimately beat by Dean in the end. How did that happen? !